October is Dental Hygiene Month! For many, a trip to the dentist might be a dreadful experience. Most of us do not look forward to the scraping, drilling, poking and sounds of an office visit. And it may cause even more anxiety if you haven’t invested time in taking care of your teeth and gums. Keeping your mouth healthy can prevent costly dental care and make your appointments more enjoyable. It also benefits your overall health! Here’s a few easy suggestions to make part of your daily dental routine. 1. Floss at least once a day. Food particles find a way to hide in the tiny spaces between your teeth and gums. Most toothbrushes cannot clean this area effectively which offers bacteria a feeding ground between the teeth and under the gums. Flossing between the teeth removes food and plaque which is important in preventing tartar (calculus) formation, gum disease and tooth decay. Gently guide floss between the teeth by using a zig-zag motion. Avoid snapping the floss between your teeth. Contour floss around the side of the tooth and slide it up and down against the tooth surface and under the gum line. Floss each tooth thoroughly using a clean section of floss. 2. Brush 2x a day for 2 minutes. It is important to take time to focus on your brushing technique. The size and shape of your toothbrush should allow you to reach all areas of your mouth easily. Be sure to brush the outside, inside and chewing surfaces of the teeth. It is recommended to use a soft-bristled toothbrush, as stiff, hard bristles may irritate the gums. Don’t brush too hard or over-brush, as this may cause toothbrush abrasion leading to sensitive teeth and receding gums. Your tongue is a breeding ground for bacteria. Brushing your tongue helps remove bacteria, reducing potential plaque build-up and bad breath and removes the coating that develops. Using a tongue scraper – specific for cleaning the tongue – may work even better! Your diet can affect the health of your mouth. Highly acidic, sugary and sticky carbohydrate foods and drinks can reduce the strength of your tooth enamel leading to tooth decay and sensitivity. Here’s a tip for identifying sources of sugar—look for words ending in “-ose” as they indicate a sugar ingredient. 5. Replace tooth brush at first signs of wear. You may need a new toothbrush sooner than you think. You’ve probably heard of the “replace toothbrush after 3-4 months” rule, but this can differ for every person.Once your toothbrush starts to show signs of wear, such as fraying bristles, it loses its effectiveness for cleaning and needs to be replaced.Toothbrushes also harbor bacteria, so remember to replace it with a new one after being sick. 6. Use Ioxan™ Gum Massage. This liquid herbal formula helps to stimulate the gums, soothe mouth ulcers and support the body’s ability to fight bacterial growth in the mouth. Containing a blend of natural ingredients including Prickly Ash bark, Calcium Chloride, Sodium Chloride and Iodine, this unique formula works to protect teeth and strengthen gums. 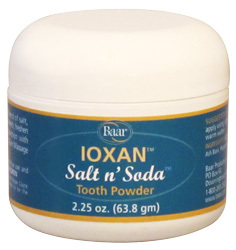 Ioxan™ may be massaged into gum areas, brushed on as liquid toothpaste or diluted for use as a natural mouthwash. 7. Brush with Ioxan™, Salt n’ Soda™ Tooth Powder. This finely-milled tooth powder combines Salt, Baking Soda and Prickly Ash Bark with a touch of Peppermint oil to keep your mouth clean and feeling fresh. Invigorates and stimulate the teeth and gums, helping to remove bacteria, odors and food with brushing. Use along with flossing, and professional dental checkups, to keep your mouth and gums healthy. 8. Rinse daily with AlkaCare®. Experience invigorating freshness with the alkalizing power of AlkaCare®. Along with brushing, flossing and regular dental check-ups, AlkaCare works to reduce acidity and restore the mouth’s pH balance. It helps combat bad breath, soothe mouth ulcers, calm sore gums and relieve a scratchy throat. Add this refreshing alkalizing mouthwash to your dental routine and experience fresh breath that lasts. 9. Schedule your dental office visit. It’s important to visit your dentist office at least once a year for a routine check-up and dental cleaning. Those with a history of dental disease or those suffering from chronic health conditions, such as Diabetes or heart disease will need more frequent visits. Talk to your dentist to determine the best schedule for your needs. Remember the health of your mouth can affect the entire body. Keep smiling! This entry was posted in Dental Health on October 1, 2015 by Dr. Bruce Baar.